The AF-S NIKKOR 20mm f/1.8G ED delivers a 20mm, 94° angle of view (30mm, 70° equivalent on DX-format cameras) that's ideal for stills or motion capture. With its 7.8-inch (19.8cm) close focus capability, you can work in tight spaces or get close to your subject to accentuate your focal point. From a distance, the AF-S NIKKOR 20mm f/1.8G ED lets you get wide, expansive vistas into the frame. Videographers will love using their Nikon D-SLR and this compact, lightweight lens for establishing shots, first-person point-of-view sequences and B-Roll footage. 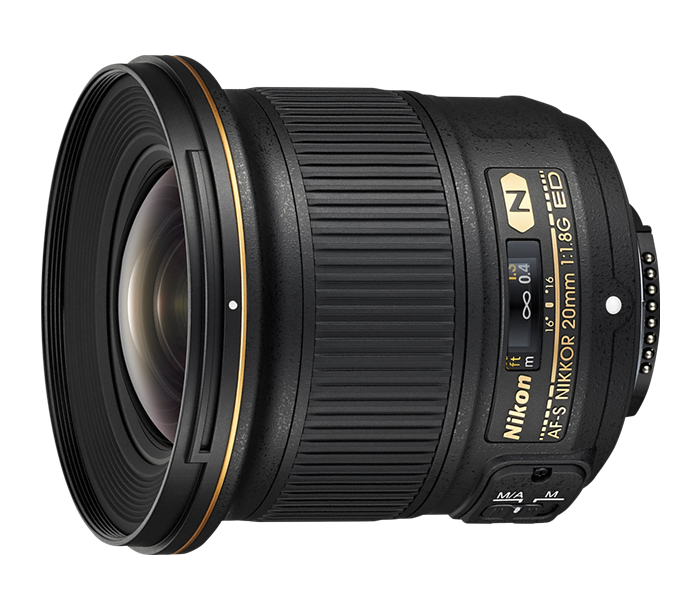 The AF-S NIKKOR 20mm f/1.8G ED is designed to draw peak performance from high-resolution Nikon D-SLRs in both still and HD video applications. Aspherical (AS) lens elements and Extra-low Dispersion (ED) glass elements with Nano Crystal Coat (N) combat sagittal flare and chromatic aberration for superb, sharp rendering across the entire frame. Nikon's innovative Silent Wave Motor (SWM) uses ultrasonic waves for fast, accurate near quiet autofocusing as close as 7.8-inch (0.2m) from your subject.